Call 719 632-9194 or 888 375-4210 for rates and availability. 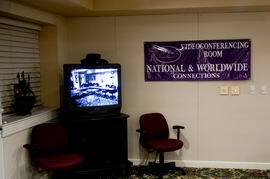 The conference facility is approximately 500 sq. 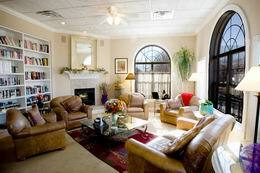 ft. and can accommodate groups of up to 24 people. 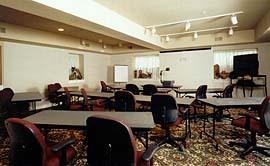 With 5-foot moveable tables and ergonomic office-style chairs, the room can be configured to meet your specific needs. From board meetings and strategy sessions to presentations and training; from awards dinners to grooms' dinners; from birthdays to small wedding receptions, the Conference Facility at the Guesthouse is ideal. 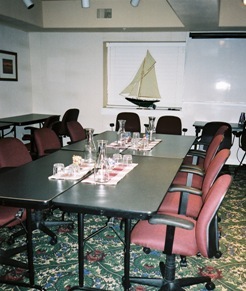 Room amenities include a full pull-down screen and an eight- x four-foot dry marker board surrounded by tack board side walls. Fax, printer and copy services are also available. The room is fully WIFI enabled. All lights are on dimmers. 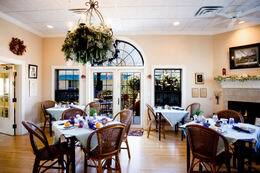 The Breakfast room may also be reserved for meetings of all types. It seats 20-24 people and is ideal for lunch or dinner gatherings, networking events, afternoon refreshments or for anytime a more intimate setting would enhance the agenda. Room Amenities include: A bright and airy ambiance, piped in music to suit the occasion, gas fireplace, access to and use of, our--smoking permitted--veranda, proximity to the kitchen and main floor restrooms. The Library is perfect for small gatherings, up to 10 or so. Brainsto rming sessions, book clubs, knitting friends, 1-on-1 conferences, even Tupperware parties have enjoyed the Library. Comfortable home-like seating and lots of windows create a cozy environment. Videoconferencing offers face-to-face interaction without the expense and inconvenience of travel. Depositions, placement interviews, even preliminary real estate shopping can be accomplished in a matter of an hour or two instead of a day or two. Our room and VC equipment can serve from just you to 24 attendees, advanced capabilities allow seamless transition of camera focus. Flawless reception is virtually guaranteed. High Speed IP technology is employed usually eliminating the need and expense of outside bridging services.